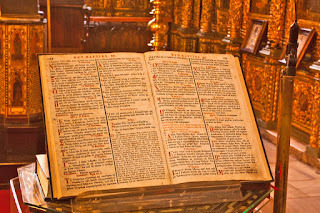 Bible in St. George Cathedral, Istanbul. Photo by Henk Hart. St. George’s is the seat of the Greek Orthodox ecumenical patriarchate and is still in use. When in his last song Leonard Cohen wrote about some of his wisdom: “… it’s written in the Scriptures … it’s not some idle claim….” he said, for me, about all that needs to be said. The secret of Scripture’s claim on us does not lend itself to capture in a magic formula. Since I make a lot of use of Scripture I do want to give a brief account of its role in my writing to help blog readers evaluate some of my claims. I will again do so in a series of 3. When we draw significant conclusions with far reaching consequences based on a reading of Scripture, we cannot take positions outside of history and speak with the voice of eternity. When we speak today about ancient and venerated documents that are recognized as sacred scriptures in religious traditions, we can only speak from within our present understandings of writing and interpretation, of ancient documents and their status as sacred, of inspiration and revelation. All major religious traditions have sacred writings. They often date back thousands of years. At times they follow oral traditions that are even older. Over long periods of time the wisdom of sages, poets, visionaries, and prophets, having shaped people’s experience of blessed guidance, acquired the status of divine counsel in human affairs. The Bible, the Koran, the Veda, and others have played and still play a fundamental role in shaping the traditions that regard them as sacred. These traditions treat these writings as sacred because they are trusted to provide an occasion for connecting people with God or the divine and for receiving wisdom in relation to especially the boundary conditions of human existence: life and death, war and peace, sickness and health, blessing and curse, origin and destiny. They address our hopes and our fears and point a way to still waters as we walk through the valley of the shadow of death. In each generation anew, people discover resources in these scriptures for coping with the human condition. As sacred texts these writings do not yield their wisdom unless we are spiritually open to asking how they address us in our hearts. The spirit that speaks in them was alive when those who recorded their witness in these texts heard the sound of wisdom. That sound remains alive to hearts that seek to be connected to this spirit through these texts. Such connection is possible only when readers/listeners are open to a spirit that transcends the texts. These texts may look like songs or poems, sayings or parables, stories or letters, histories or tales. But none are intended to be what at first sight they seem to be: a letter to an ancient community of faith in Rome, a song celebrating victory in a battle many millennia ago, a story that recalls how a king ruled his people. Rather, they are all carriers of wisdom unto life taking on the character of what they initially look like. In their specific and historical embodiment as this letter, this poem, this story they give voice in their time to wisdom that is inspired by the living spirit at all times beyond this poem, letter, and story. When that wisdom is heard it can be voiced anew in a language of another time and speak to the experience of that time. To the open heart the wisdom remains available in all ages as guidance from a living spirit. When in later ages the wisdom of sacred writings is re-worded, those who recognize the spirit of that wisdom will also recognize it in the ancient sources. If the darkness of our time shapes our experience of light as compassion, Christians will see that light shine brightest in the life and death of Jesus. But they will also be able to see that same light flickering in Genesis when God not merely expels Adam and Eve from the Garden, but also protects them in their vulnerability by clothing them; or when God after the Flood, moved by a human offering that reconnects God and people, swears by the Rainbow never again to destroy the whole earth because of evil. Literature that has these characteristics is more than classic. It is classic in so far as its value is recognized whenever and wherever it is read, throughout the ages, across cultures. But in being experienced as sacred this literature is miraculous: it sheds light in our darkness and provides contact with mystery. Abiding sacred writ carries traces of wisdom that help us live with hope in the face of the mystery. Our awareness of that mystery is shaped by our inability to trace the origin of meaning or to control our destiny, our impotence to conquer death or to overcome guilt, our yearning for joy that will not end or for a final cure to our ills. In sacred writ the spirit allows our restless hearts to find rest even as the mystery remains. Holy writ is not an untrue story, but a trustworthy embodiment of God’s hope for the world. Its language, in all of its forms, is therefore always metaphorical, it carries us beyond the surface of its primary language, its times, its customs, its understandings toward light that clears up our darkness. What the sacred writings say is never the same as what its texts say literally on their surface. Holy writ is our name for bodies of language in which the sound of the wind can be heard as the voice of the spirit. That voice has gathered communities of people who had ears to hear and has directed them in their journey from a beginning they cannot re-trace to a destiny they only know as promise. These communities have recognized the voice as the sound of trust. In that trust they discovered that following the voice where it guided them revealed light in their darkness. Holy writ of the ages that has come to us in the history of the great religions is for the most part multilayered. The texts have a complex history and their wisdom addresses us in so many ways that the history of their interpretation may seem filled with conflict and contradiction. But if the elements of these texts are understood as the fragments of a kaleidoscope, we can appreciate the validity of the endless configurations of these fragments. They come together in wondrous harmonies of color and shape that surprise us with their joyous play of light. At any given time in history the changing pains and hopes of successive communities of readers give shape to different sensitivities that highlight different elements of the actual texts. We give these actual readings our trust when we perceive them as insightful in relation to our time’s specific shape of the mystery, in relation to the texts, to the history of interpretation of the texts, to the time transcending spirit of the texts, and to the centuries of fellowship with other readers whose witness to the texts survives the particularities of their times.